The root of creativity, I believe, springs from two things-” keen” observation of the natural world as well as of man and secondly, taking note of what lies within oneself at all times. The artist must be an attentive observer of the natural world both of large and small phenomena- the motion of the sun in the sky, the variety of shadows, the color of light and its effect on objects, the feeling for a specific day and time as well as a turn of a leaf, the shape of a twig, the movement of a bird, the feeling expressed in a face- all are part of a larger unity of all things that one only senses when one has seriously taken note of the world in all its manifestations. This intensity of observation is one root to the tree of creativity. The other is being an observer of oneself- those thoughts, dreams and intuitions that come to us in a blast of insight as well as in a quiet whisper. One must take note of those things that strike one in profound and subtle ways. I often think of the quote of St. Augustine in his “Confessions”, “that I might know myself in order to know You”. Only by observing oneself and those inward manifestations that produce insight is one able to be connected to one’s deeper self and, in a way, to all humanity. From this double root springs the tree of creativity that one hopes, with deep longing, will flower. Artistic creation is the fusing of both types of observation. But how do they come together? Reverie and intuition when joined to sensory observation release, what many artist have called, the waking dream. This waking dream, this deep sense of reverie melded to our inmost feelings, produces the “creative insight”. I find that when I am in the act of painting my mind wanders in and out of my subject and puts me into a state of reverie and in this state many insights come to me- ones specific to what I’m painting presently but also those images that are seeking form and have yet to be manifested. I also receive intuitions about my work in general or my personal relationship to the world. This waking dream not only produces the creative insight but allows “images” that are unsought for to present themselves. The Sufi masters described this waking dream as the “isthmus” to the imaginal world of images. This image appears with such force and conviction that one becomes compelled to manifest it. This inner compulsion cannot be ignored. It eats away at the artist until the work comes to fruition. So much passes before our eyes and is lost. One cannot “hold” it and look at it keenly because we have not developed the capacity through these two forms of observation to seize it(either insight or image). 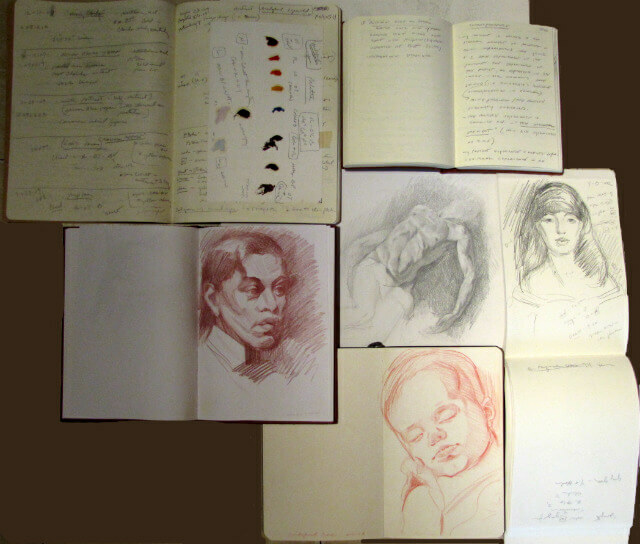 Keeping a journal is a method that aides in both the inner and outer observation necessary to be a creative individual. What seems at times to be unimportant later reveals itself to be significant. It is these threads of “significances”, when joined together, that act as a map. I like to think of the artist as a cartographer mapping his own myth that is at once himself as well as a microcosm of the” soul of the world” as Carl Jung called it. Many times, I have felt a new insight and noted it in my journal only to look back on older notes from years past and find that I had observed the same thing then. But now this idea is more developed and more closely linked to the way my painting is unfolding. It has taken on more significance. I begin to see how something that was latent within me has come to maturation in a hidden and subtle way. If I did not have a journal, I would have to rediscover the same idea over and over again- re-invent the wheel. The journal not only reveals how one sees the world and how one feels but also leaves one open to the unexpected. What appears as a passing moment or unexpected revelation, takes hold within our soul and adds to our own transformation as well as that of the world. Thanks for sharing your sketch books. Beautiful work. Nice to see. Thought provoking and rich w/ references. But at the same time refreshingly clear and direct. (Like your work!) Resonates, Judith. As do so many of your posts. Thanks for taking the time to share your experience and insight.